Is it time to ‘Braven’ singing along in the shower? THERE'S little disputing the wonders of combining music and showering. Fortunately the logistical uncertainty of bringing stereo equipment into the bathroom has stopped being a problem. 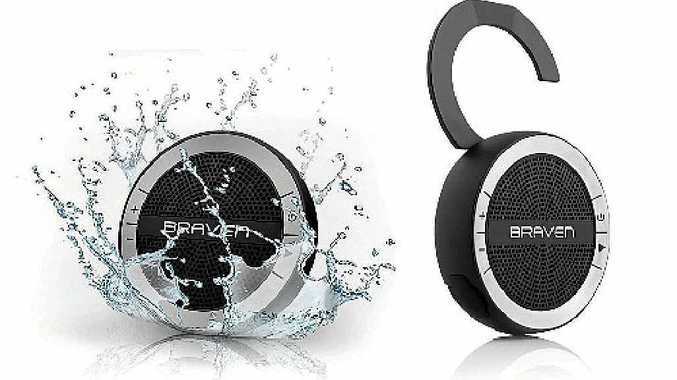 Bluetooth speakers are common but waterproof varieties, like the new Braven Mira, aren't as well known, despite being a godsend for showers and pool parties. The Mira has a hockey-puck shaped speaker that hooks onto your shower head (or pool fence) and connects with Bluetooth or a 3.5mm jack to play music without dying as soon as you wet it. I tried. Holding the Mira under the shower stream for 20seconds couldn't stop REO Speedwagon. The sound quality is on the upper end of what you'd expect in the $100-$150 price range. Obviously, the unit is battery- operated and rechargeable. I've been using the Mira while showering for two weeks and haven't yet needed to charge it, though that shouldn't be a surprise given the claimed 10-hour life between charges.